A new painting! This image shows my painting ‘Strutting Peacocks’ - the first of a series of paintings of World War 1 aviation subjects done to commemorate the forthcoming anniversary of this war in 2014. This shows four Albatros D.V aircraft belong to Jasta 5, the most colourful unit in the German air service in WW1. 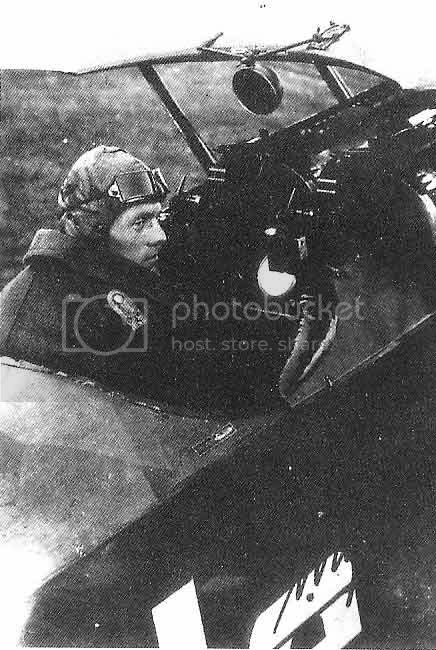 This unit hosted some exceptionally gifted pilots, including fourteen aces. 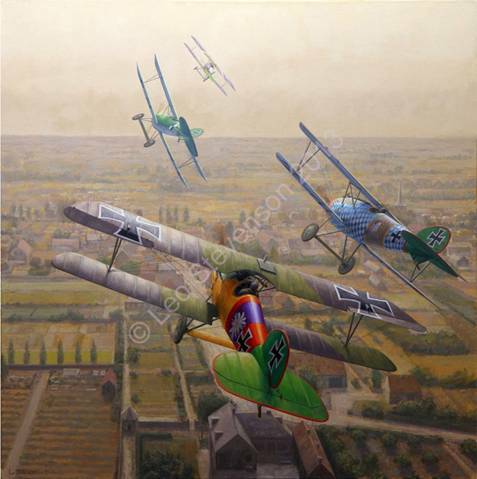 The aircraft are shown over northern France in July 1917; foreground to background, the pilots are Paul Bäumer (1896-1927), Ltn. [?] Wolf (?-possibly killed in action 1917), Otto Könnecke (1892-1956) and Richard Flashar (CO of Jasta 5, 1891-1946?). This painting is now available as a signed limited-edition high-quality ‘giclée’ print. There will only be 250 of these prints sold worldwide, go to http://www.leostevenson.com/PrintsD/printsD.html to buy yours! The cost is only £74 and postage is free if you live in the UK. If you live outside of the UK please email leopaint8591-leoweb@yahoo.co.uk for the current cost of posting it to you. Each print measures 50 x 50 cm and it will be sent rolled up in a stout tube within 28 days of receipt of payment. Payment can be safely made via PayPal. See my website for news of further paintings in this series. These are very high quality ‘giclée’ prints made using acid-free archival quality paper made by Hahnemühle and the Lucia 12-colour pigment ink system. I individually sign and number each print myself. These special giclée prints could become collector’s items and they should not be confused with cheaper ‘open-edition’ lithographic prints or posters. AEROPLANES? IS THIS SERIOUS ART? YES! Paintings of aircraft as a subject are a natural extension of my landscape and seascape paintings. Aviation art is a valid genre in its own right; it should not be dismissed as mere ‘illustration’ because of its realism or because it depicts historical events. Paintings of historical subjects have always been an important part of western art, for example look at Rembrandt’s ‘Night Watch’ or Leonardo da Vinci’s ‘Last Supper’. Ok, I'm not as good as those guys (yet! ), but my point is a valid one. The skills used to compose, arrange and depict the elements within aviation paintings are as valuable and valid as any other kind of serious painting. Aircraft can also be incredibly beautiful. PLEASE NOTE - The original oil painting of ‘Strutting Peacocks’ will itself shortly be for sale, and for a price on this or any of Leo’s other paintings that are still available please email leopaint8591-leoweb@yahoo.co.uk . Finally, I have ‘blind-copied’ you into this email to protect your privacy and the privacy of all the other recipients. Please forgive this mailing and rest assured that I won’t make a big habit of it (unless you do want regular updates) and I will never give your contact details to third parties without permission. Beautiful painting but where is Vonhippels ever-popular mount? Leo is also a very talented model builder. Man I want that painting....Nice post thanks!